The timeless look of a canopy bed has never gone out of style, largely due to the versatility and ever evolving designs for this bed type. No matter what type of decorating scheme you have envisioned for a dream bedroom, you can find a canopy bed to fit the bill. 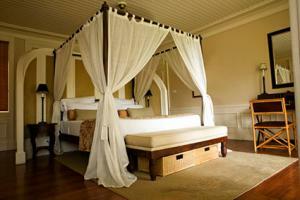 Traditional style canopy beds create a sense of luxury and romance in the bedroom. Even from the very beginning, canopy styles have continued to change and evolve, complementing a range of bed designs and decorating styles. During the 13th and 14th centuries, the first bed canopies came in the form of a wooden tester, suspended by cords hung from overhead beams. Testers then evolved into part of the bed frame, attached at the head by a large wooden panel and supported at the foot of the bed by two wooden posts. Half-tester beds have only the wooden upright panel at the head of the bed with a small wooden overhang. 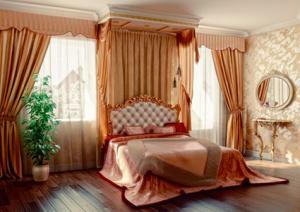 Curtains and rich fabrics were added to the ornately carved wooden frames. Modern wall mount canopies or bed draperies designed to embellish the head of the bed are typically referred to as half-testers, coronas, bed cornices, bed crowns or wall-tester bed crowns. 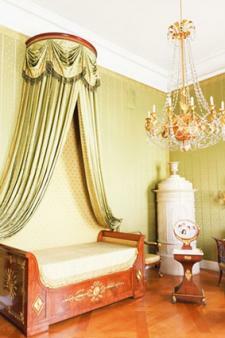 A bed crown or corona consists of a semicircle or arched hardware from which draped fabric is hung, encircling the headboard and tied back at each side. A bed cornice consists of a wood or fabric covered cornice board with draped panels that hang behind the bed and on either side at the head of the bed. Loosely draped fabric with swags or scalloped bottoms on coronas and cornices lend a traditional feel and an upscale look. Bed crowns draped in sheer or silky fabric add a regal touch to a bed. Keep a formal, upscale look in the room with traditional French or English reproduction furniture. A Louis XVI style daybed makes a perfect complement to a traditional corona. With some Rococo style chairs, a dresser and an overhead chandelier, your bedroom will feel like a palace room at Versailles. By the 15th century, massive, stately four post beds with intricately carved frames became prized possessions of royalty and nobility. 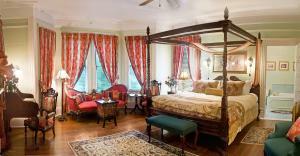 Draped in luxurious textiles, these beds were befitting of their palace surroundings. 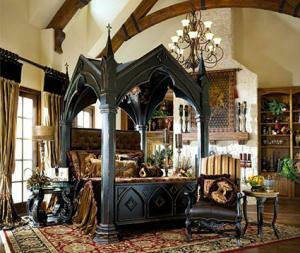 If your style is Gothic, Old World European, Victorian or you just want a statement piece for a formal, upscale bedroom, a medieval style four poster bed frame provides that wow factor. Embellish the bed frame with luxurious, heavy drapes or fabrics of silk, satin and velvet, embroidered pillows and tapestry style bedspreads. Include lavish window treatments and ornate mirrors over dressers or vanity tables. Add a fainting couch or Queen Anne style chaise lounge for a boudoir feel or the bedroom of nobility, where the lady of the manor entertained friends and chivalrous courtships. For a slightly less formal look in a country or cottage style bedroom, dress a traditional four poster, full tester or half-tester bed in shirred, ruffled or frilly valances and curtain panels tied back at each corner with decorative ribbons or ties. Wrought iron or wood frames in white are often paired with tone-on-tone white bedding or small floral prints. Painted wood furniture in antique white, ivory or pale, pastel colors lend a relaxed, comfortable feel in the bedroom. Distressed finishes are a trending look for cottage style interiors, popular for the distinctive character they provide. A typical colonial style canopy bed features pencil post rails, which delicately taper toward the top. Top rails can be either straight or arched. Checked fabric with small ruffles on each side and sometimes a panel hanging behind the head of the bed was commonly used on straight top rails. Most notable were the hand-tied fishnet canopies, with designs such as double and single diamonds, large scallop, lover's knot, straight edge and the Margaret Winston. This type of canopy bed fits perfectly in a historic colonial style bedroom or paired with early American reproduction furniture and traditional colonial furniture styles. Primitive style bedding such as a vintage chenille bedspread, candlewick bedspread or patchwork quilt adds a touch of rustic charm. Designed for style and easy portability, campaign furniture provided some of the warmth and luxury of home to British officers and civilian gentlemen traveling abroad in pursuit of colonial efforts during the 18th and early 19th century. The elegant iron frames of campaign style canopy beds are inspired by the "knock down" designs of furniture that represented the height of fashion during the golden age of travel and global expeditions. The sweeping, curved top rails of a campaign style canopy frame make a dramatic impact when filling vertical space in a room with a vaulted or cathedral ceiling. Leave the rails uncovered for an airy feeling of spaciousness or drape the bed in sheer fabric for softer feel. Combine the bed frame with sleek, modern furniture and contemporary bedding for a transitional style room. In a traditional setting, layer long panels of fabric from the crown down the curved rails and corner posts, allowing it to puddle on the floor. Place an antique trunk or chest at the foot of the bed or stack vintage suitcases in a corner for a nod to colonial travel and adventure. Another romantic canopy bed style is inspired by traditional four poster bed frames typical of British Colonial or plantation style decorating. European colonists settling in tropical locales such as the East and West Indies, Africa and India produced formal style furniture using local tropical hardwoods. Mosquito netting draped over the bed frame may have only served a utilitarian purpose initially but the striking contrast of white gauzy material against the dark wood of the bed frame and other furnishings in the room created an undeniably appealing aesthetic. Sheer white curtains provide a similar look. Inspire a tropical feel in the room with furnishings made from exotic woods such as bamboo, rattan, teak, mahogany or wicker. Incorporate organic texture with rugs or baskets made from jute or sisal. Make sure you are buying from a reputable dealer that only sells eco-friendly or sustainable furnishings made from tropical materials by looking for the Forest Stewardship Council (FSC) logo. The way a canopy bed is styled can make it feel more modern and less traditional. Four poster bed frames transition easily into modern and contemporary settings when the top rails are left uncovered, emphasizing their sharp geometric lines or sleek curves. Simple fabric panels draped across the top rails or understated curtain panels left to hang naturally soften the look of canopy frames while blending seamlessly with modern and contemporary design styles. Black-and-white color schemes fit well with minimalist decorating styles in modern settings. White walls contrast sharply with dark, glossy wood floors, black lacquered furniture and dark wood trim, adding a sophisticated feel to the room. Drape white fabric panels over a black wood or metal four poster frame and add a bright pop of color with bedding accents in red. The clean, geometric lines of a rectangular cornice mounted behind the bed makes an elegant accent with minimalist style furnishings. Snugly tailored fabric and simple, pleated drapes lend a comfortable yet well-styled feel. For a mid-century look, mount a starburst mirror or clock between two twin beds with matching bed cornices. A corona canopy can also work in a contemporary bedroom with tailored fabric covering the hardware. A simple stripe or Greek key pattern bordering the bottom of the top piece and repeated as trim on each curtain panel edge adds a contemporary touch. Complement this look with a fabric covered headboard. Use minimalist style bedside tables, a modern dresser and consider an accent piece such as a swan or egg chair. With ceiling mount curtain rods, drapery hardware, embroidery hoops and ceiling hooks you can create your own draped canopy bed without needing the top rails of a four poster frame. 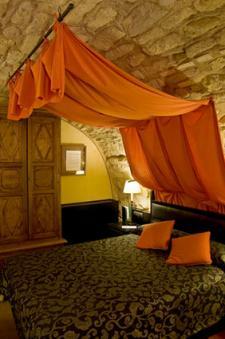 Mount a curtain rod on the wall near the ceiling behind the bed to drape a tapestry style fabric panel behind the bed. You can extend this look by mounting another curtain rod to the ceiling directly over the bed. 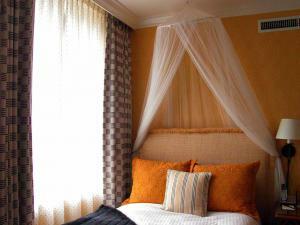 Gauzy or sheer material can also be hung from ceiling hooks for the impression of a canopy draped bed. You can purchase a ready made ceiling canopy or design your own by stapling gauzy material to the ceiling. Watch how Meg Stone transforms a bed into a romantic focal point for detailed instructions. Inspired by Napoleon's bed in Chateau de Malmason, a simple wall-mounted drapery rod installed over a daybed provides a tent-like light canopy when fabric is draped over each side of the bed. Depending on the style of the bed and the other furnishings in the room, this canopy can look casual or formal, traditional or modern. 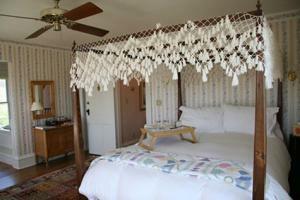 Find bed drapery hardware at Antique Drapery Rod Company. Choose rod pocket curtains in sheer material or a fabric that complements the style and color scheme of the room. 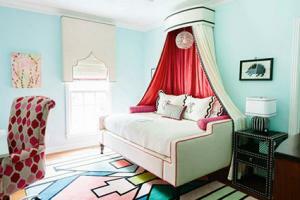 Hoop style canopies are hung from the ceiling and can be centered over the head of the bed or the middle of the bed. They have center opening with fabric that drapes around three sides of the bed. You can make this type of canopy using an embroidery hoop, ribbon and rod pocket curtains. Country Living's simple tutorial offers steps you can easily follow to do it yourself. With gauzy or sheer material, a hoop canopy can look tropical or just soft and dreamy. Do-it-yourself decorators continue to expand the range of canopy bed designs with colorful patterned fabrics and hardware as simple as wooden dowels. Place fairy lights under sheer or gauzy material, accent curtain panel edges with lace or decorative trim, or add silk flowers to hoop canopies. The possibilities for personalized options abound no matter what style of bed canopy you desire.